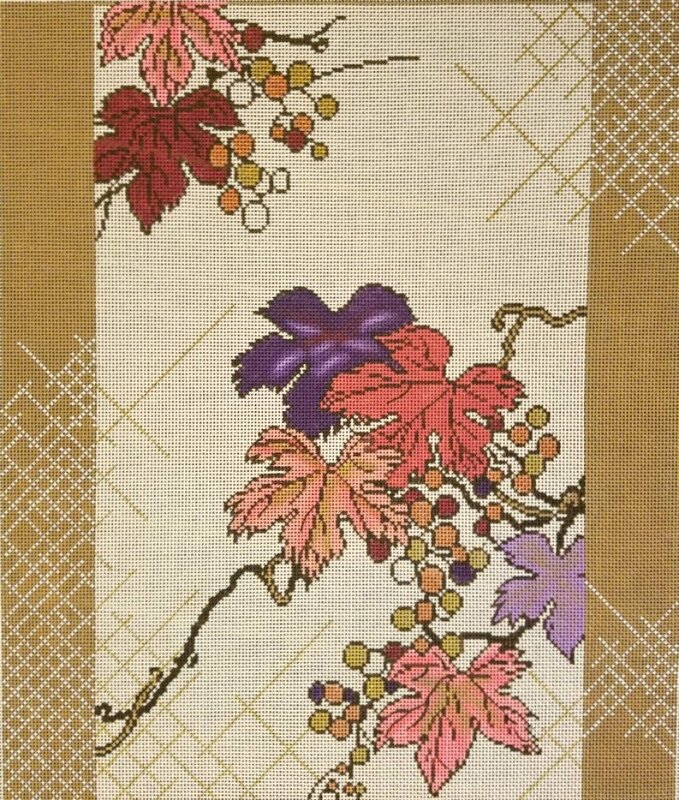 This fall colors grape leaves needlepoint design is handpainted onto 13 mesh Mono Zweigart needlepoint canvas. The rich plum and lilac grape leaves are handpainted on a cream mesh background with gold metallic accents. The background color will be off white unless you request another color. The design area measures 15" x 17" and will stitch into a stunning piece of art with soft tones and gold accents. This grape leaves fall needlepoint design is sold canvas-only or with fibers. All fiber options include metallic gold for the accents. if you select wool or silk we will send Planet Earth fibers. This Red Thread grape leaves needlepoint design is usually in stock and ships within 1 week. If it is out of stock we will let you know. Contact us if you have any questions about this Red thread fall needlepoint canvas. We are always glad to help.